Tile surfaces are common in many homes, leading to a need for professional tile and grout cleaning services. Both beautiful and functional, unique tile designs bring life to any room. However, these surfaces can grow dingy and dirty, leading to an overall diminished appearance in your home over time. If you’re a homeowner with tile and grout surfaces, there are a few important things you should know about the process of keeping them clean. Read on to learn more! One of the reasons that grout develops a dirty appearance even while the surrounding tiles stay shiny and clean is because grout is especially porous. That means it’s especially easy for dirt, bacteria, and germs to get trapped inside. 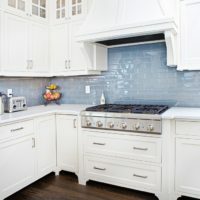 Most homeowners know that professional tile and grout cleaning is a great way to keep their surfaces looking great, but some don’t realize that these services also help to keep their home clean and safe. The Grout Medic utilizes state-of-the-art steam technology to deep-clean grout without the use of harmful chemicals. Cleaning your tile and grout regularly is a great way to prevent dirty and unsanitary surfaces from becoming an issue. When tile and grout surfaces aren’t cleaned regularly, a buildup of waste can occur beneath the tiles. This can lead to loose tiles that will require repair. Fortunately, The Grout Medic is also well-known for our speedy and affordable tile repair services! But if you’re looking to keep your surface looking great without the need for a repair, regular tile and grout cleaning is a great preventative measure. Another possible effect of leaving tile and grout surfaces uncleaned is water damage. As mold, mildew, and limescale build up under tiles, their firm bond to the underlying surface loosens, allowing water to seep in. If your surface is in an area that is regularly exposed to water, such as a bathroom, this can lead to costly water damage. Grout Medic offers a comprehensive array of water damage repair services, but a great way to avoid needing them is to regularly clean your tile and grout surfaces. Many people put off cleaning their tile and grout surfaces because they’re trying to avoid the hassle. It’s easy to understand why – many homeowners are wary of letting service providers into their home and dread simple services that may turn into costly repairs. The Grout Medic works hard to ensure that the process of working with our technicians is as simple as possible. Our highly-vetted technicians work around your schedule, providing services when it’s convenient for you. We pride ourselves on getting in and out quickly with minimal hassle to our clients. Best of all, we do our best to work within your budget, providing the services you need at a great price. Whether you’re in the market for tile and grout cleaning or more comprehensive repair services, The Grout Medic can help! Contact us today to learn more about what we can do for you.